Funeral services were held at 2:00 p.m. Monday, January 10, 2000, at Locke Funeral Home in Waterloo for Burton L. Adams, 70, of 520 Jefferson Street, Hudson. Burial was in the Hudson Cemetery. Military rites were conducted by Anderson AMVETS Post 82 of Hudson Post 19 of Waterloo and Post 31 of Evansdale. His son Jeff folded the flag at the service. Burt died Friday, January 7, 2000 at Covenant Medical Center, Waterloo, following a lengthy illness with cancer. 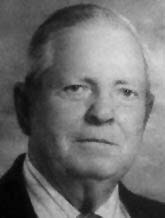 Burton L. Adams, Son of Daniel Clifton Elroy and Ruth Mae Wiseman Adams was born April 15, 1929, in Clarinda, Iowa. He attended grade school at Garfield School and later at the Toledo High School in Toledo, Iowa. Burt joined the Army in 1946, achieving the rank of Corporal (T). He was honorably discharged from service in 1952, receiving the Purple Hart. He served in World War II and the Korean War. He married Joanne Isenhower on October 9, 1955, at the Evangelical United Brethren Church in Hudson. Over the course of his life, Burt worked in construction as a cement finisher for John Deere, Taylor Isenhower Construction and Lockard Construction, retiring in 1992. Burton was a lifelong member of the Hudson AMVETS Post 82. He was the Commander four times and the 3rd District Commander. He attended the Cedar Valley Church. He was active in the community, having helped with the Little League Summer ball program for several years and participated in many of the AMVETS sponsored programs in Hudson. Following his retirement he raised tomatoes and worked at the local golf course. He is survived by his wife, Joanne; four sons: Michael L. of Waterloo, Robert D. of Tracy, California, Daniel of Urbandale, Iowa, and Jeffrey L. of Valparaiso, Florida; five grandchildren: Carl and Elizabeth, Jacob, Jeffrey and Chris and a brother, Glen. He was preceded in death by his parents, three brothers: Clifford, Donald and Richard; two step-brothers: Albert and Arthur; and three step-sisters: Lena McElroy, Ola Davis, and Ada Adams.